I'm just gonna say it. THE FIRST DAY OF FALL IS THURSDAY! Thursday may be the first day of fall, but my heart has been celebrating for a while now. 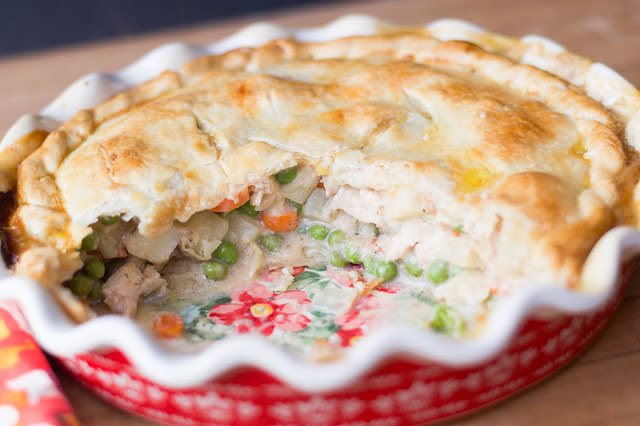 With the change of the season its time for comfort food, and nothing is more comforting than a Chicken Pot Pie. "Mandee, ain't nobody got time for no chicken pot pie on a weeknight!" Okay, time to get started! The first thing you will need to do is preheat your oven to 425 degrees. While your oven is preheating, you can sauté your onions and carrots in a hot pan, until soft and translucent. After you have done that, remove the vegetables from the pan and add the butter. To the melted butter add the flour. Whisk the butter and flour together until smooth. You have just made what is called a roux, and this is what is going to give you that luscious, thick, gravy in your pot pie. For this next step you have two options. You can use either milk or chicken stock to make your gravy. I was out of chicken stock so I used milk. Either way it is going to be delicious. While whisking, slowly pour in your milk. The whisking is so important because you don't want your gravy to be lumpy. Continue whisking and simmering until the sauce thickens. This usually takes 3-5 minutes. Now you can add the carrots, onions, and peas to the gravy. After that you can add the chicken. There are a couple options for cooking the chicken as well. You can use a rotisserie chicken, you can grill some chicken up, boil it, heck you can even buy precooked chicken. However, my preferred method is to roast it at 325 for about 25-30 minutes. I usually do this in batches when chicken is on sale and keep some in my freezer. 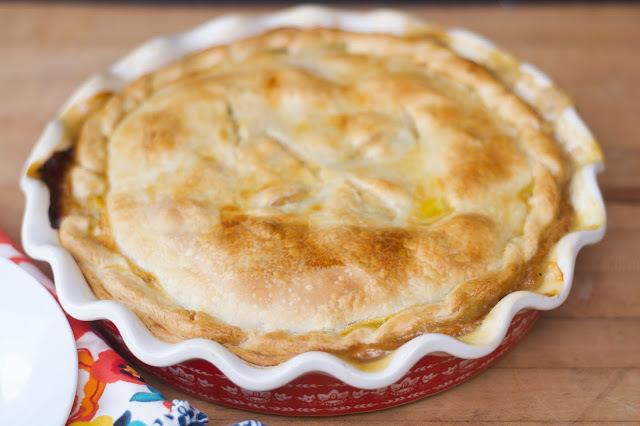 You can't have a good chicken pot pie without potato, but who wants to mess with the par boiling part? Not me. To remedy that, I just place it in my microwave for 3 minutes to par bake it. Next I dice it up. I don't even bother removing the skin. Add the potato to the gravy as well. 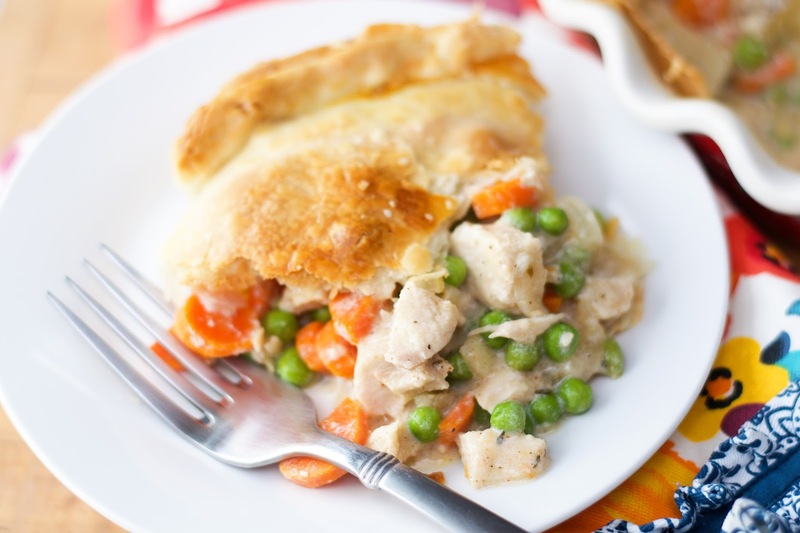 This next step is what's going to make this Simple Weeknight Chicken Pot Pie Stand out from the rest, the seasoning. Sure you could use basic salt and pepper, but if you can make it better why wouldn't you? Ladies (and gents) USE THOSE SPICES! Add your seasoning to the gravy and mix everything together. Now that the hard part is finished (and let's face it, that wasn't even that hard really) we can assemble the pie! One of the ways we are keeping things quick and easy is by using a pre made crust. Don't let anyone shame you for this. Pie Crusts are an art, and MANY of the best cooks I know struggle with them, me being one of them. LOL So you do you boo and use the store bought one. If you would like a great homemade recipe, I will leave my grandmother's recipe (HERE) and my gluten free option (HERE). 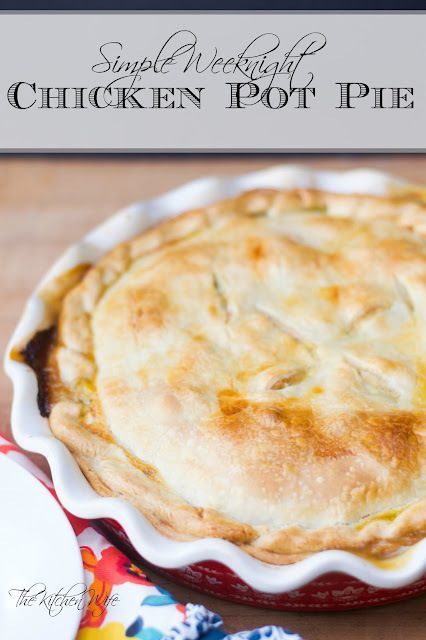 Place one of the pre made pie crusts on the bottom of your pie dish. I am using The Pioneer Woman Vintage Floral 9" Pie Plate, but any 9" pie plate will do. Now take a fork and poke holes all along the bottom of the crust. This will prevent it from bubbling up and ruining the base of the pot pie. I'm not going to lie you here, I totally ate some of this with a spoon it is THAT good. Place the other pre made pie crust over the top of the filling, and fold the crust over to seal the edges. You can see that I am no artist when it comes to pie crusts, but this is supposed to be a rustic dish, right? Anyway, you will need to cut a few vents into the top of your pot pie. To give it that gorgeous, glossy, finish simple beat and egg with a little bit of water in it and brush over the top of your entire pie. Put your Simple Weeknight Chicken Pot Pie onto a foil lined baking sheet to catch any overspill. Place into the preheated oven and bake for 30-40 minutes. I actually pulled mine out at 37 minutes. Look at that glorious, comfort food perfection! Beautiful, golden, flaky crust. And the smell, I wish we could have scratch and sniff photos on our blogs because WOW! I'm literally drooling while I gaze upon that flaky crust and hearty filling. 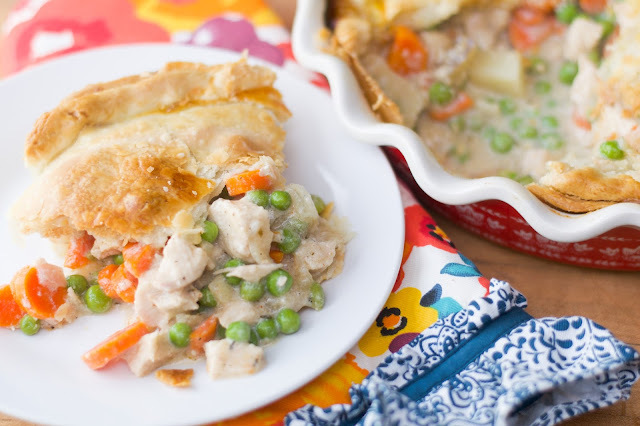 No one would ever guess that this Simple Weeknight Chicken Pot Pie was so effortless. I would also like to add that this would make a wonderful freezer meal. Just omit the baking part before freezing. So celebrate the autumn season coming with this Simple Weeknight Chicken Pot Pie! I know you and your family are going to love it! Happy Reading, Happy Eating, and Happy Fall! Sauté the carrots and onions in a hot pan until soft and translucent. Remove the sautéed vegetables from the pan and add the butter. Once the better has melted, add the flour and whisk together until smooth. While whisking, slowly pour in the milk. Whisk until thick and smooth, about 3-5 minutes. Add the salt, pepper, garlic powder, dried thyme, paprika, and chili powder. Place one of the pie crusts on the bottom of a 9" pie dish. Using a fork, poke holes all along the bottom of the crust to prevent it from bubbling up. Place the other pie crust over the top of the pie plate and food the excess crust over to seal it. Cut a few slits in the top of the crust and brush the top of the pie with an egg wash which is 1 egg beaten with a splash of water. Place on a foil lined baking sheet and bake in the preheated oven for 30 to 40 minutes, until the crust is golden brown. *To Cook Chicken: Season with salt and pepper and roast in a 325 degree oven for 25-30 minutes. To Cook Potato: Place in the microwave and cook for 3 minutes. My favorite meal!! Looks wonderful. You are so welcome!!! And THANK YOU!!! Yes! Dinner is on. Of course I don't have any vegetables in the house, but this sounds so good it is worth a trip to the store. Yay! I can't wait to hear how it turns out for you!